So why should Grand Haven be your favorite Lake Michigan Beach Town? How about its boardwalk, arguably the best one of any of our featured beach towns? Or how about its beach, with one of the biggest expanses of coast line on the sunset side of Lake Michigan? A perfect little main street downtown shopping area dotted with excellent eating and drinking stops. Yes, the big three of attractions for Beach Towns (beaches, shopping, restaurants) are here, and in abundance. And as usual we want to tell you about our favorites . . . .
Have you noticed a trend with our family? Possibly yours is just the same. That is our vacation days start and end with places to eat and drink. We love finding the spot that has the perfect beach town ambiance combined with the best location and then add in quality and price . . . well you get what we mean. In Grand Haven that place for our family is Kirby’s. Sure it looks like any other building at the corner of small town USA, but walk in and you will be surprised. 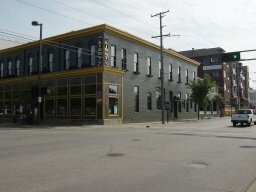 A great bar downstairs, a restaurant/game room upstairs, and a great party deck with excellent views of the riverfront. And it is very kid friendly. 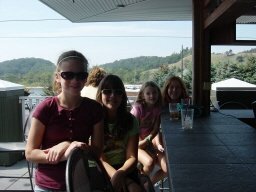 Here are Alyson and Anna plus friends enjoying a great day in Grand Haven on the deck at the Kirby. The Kirby is just an excellent spot to start the day, take a break in the middle, or end your day. Not only for the reasons I mentioned before, but because it is just smack dab in the middle of everything. 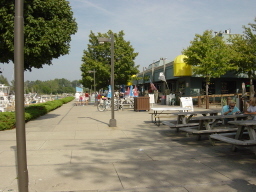 Next to the main shopping street, across from the boardwalk, and right by the inlet to Lake Michigan to watch the boats coming and going. But I must admit it is a ways from the main beach. 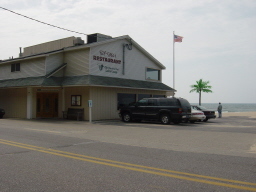 If you just don’t want to leave the beach area to eat or drink then the Bil-Mar is a must. It is all by itself on the beach by the state park and offers one of the best places on Lake Michigan to catch the sunset. Ok, so the palm tree is fake, but the scenery is as real as it gets! So let’s go back to the Kirby and cross the street to the boardwalk. Take it the left (facing the water) and you go right out to Lake Michigan. Take it to the right and it ends at the best ice cream shop in town, complete with more beachwear shopping. 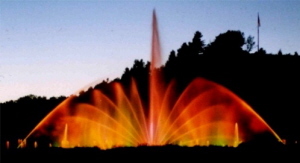 And in the middle across from town is one of the world's largest musical fountains. This is definitely a family must as the fountain puts on a music and light show every summer evening (and has since 1963). A great way to end the day is to catch the sunset while watching the Grand Haven Musical Fountain!! 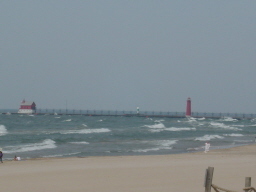 Right next to each other is the Grand Haven State Park Beach and the Grand Haven City Beach. As I said before this is one long expanse of beach complete with pier, lighthouse, and miles of sand. We call them Lake Michigan Beach Towns for a reason. A trip to one is not just not complete, but almost a crime if you don’t go to the beach. Walk the shoreline, venture out on to the pier, hit the concessions, go to the Bil-Mar and have a drink on the deck, overall just a great time. Check out the Grand Haven State Park Beach! Our family loves Grand Haven shopping, not because of the abundance but because of the uniqueness. Not just your everyday beachwear shops or something for everyone, but the odd and eclectic shops you can find. Make it a point to go in different shops and see what you find, you may be surprised. Check out Shopping in Grand Haven! A family vacation’s success comes down to one thing, where did you stay. Again, we cannot say it any more clearly, pick your place to stay closest to what you like to do the most. If you can’t live without the beach and the sunset, then you have to look at all of the Grand Haven cottages for rent across from the beach. Some of them are tucked on top of the hill, so make sure you can handle the stairs if need be. Downtown has tons of cabins and cottages and Bed and Breakfasts’ for rent. All within walking distance of the boardwalk and downtown shopping and nightlife. 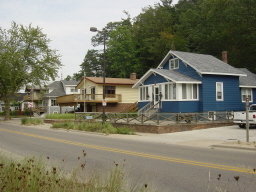 Check out our cottages for rent and Lake Michigan Lodging pages for more information. 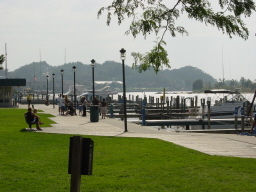 And make sure you get to Grand Haven and let us know what you think. Possibly the best Lake Michigan BeachTown? 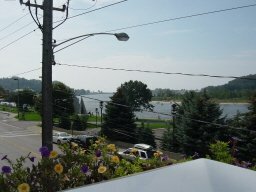 Check out Available Rentals in Grand Haven!